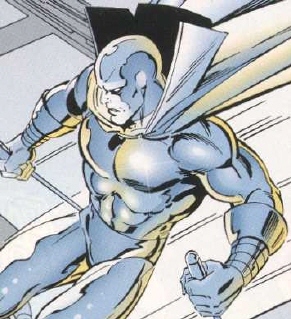 Powers/Abilities: As the Asgodian avatar of death, the Silver Racer possesses a pair of cosmically-powered silver skis that enable him to fly at great speeds as well as the ability to induce death with a mere touch. His cosmic powers also allow him to effortlessly render mortals unconscious. History: At some point in history, human Willie Lincoln was chosen to become the Asgodian avatar of death known as the Silver Racer. (Journey Into Forever #?) - "To Die Like A New Asgardian" - Silver Racer first encountered Thorion. (Spider-Boy Team-Up #1) - "Too Many Heroes -- To Little Time!" - In Manhattan, the Silver Racer effortlessly whizzed by the Baxter Building's hi-tech defenses as Spider-Boy's business manager, Rex Leech, made arrangements for Spider-Boy's upcoming wedding with Insect Queen over the phone with Gideon Jupiter. Using his tentacles, Dr. Otto Octavius attempted to protect Rex Leech and Betty Brant from the Asgodian avatar of death, but the Silver Racer simply used his cosmic powers to render the trio unconscious (since they had no role in that which was about to transpire). 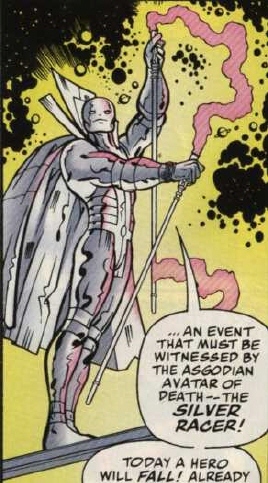 Hovering above Spider-Boy's fallen staff, the Silver Racer announced that a hero would fall on that day -- an event that must be witnessed by the Asgodian avatar of death. (Challengers of the Fantastic #1) - "Four Against the Unknown" - Soon after, the Challengers of the Fantastic arrived at the Baxter Building in order to battle Galactiac in Manhattan and were shocked to find the unconscious bodies of Octavius, Leech, and Brant lying on the floor. The Silver Racer explained that he was there to claim the life of a fallen hero and instructed the Challengers of the Fantastic to confront Galactiac and play their part in the events which were about to unfold. As the Challengers of the Fantastic raced to the top of the Baxter Building to confront Galactiac, the Silver Racer remained in the Baxter Building with June Masters. June pleaded with the Silver Racer to use his vast powers to help the Challengers in their struggle against Galactiac, but the Silver Racer explained that he merely collects the dead -- he does not decide who lives and who dies. But June insisted that the Silver Racer was not an unfeeling machine and must realize how precious life is. As June touched Silver Racer's face, something about June reached deep inside him, touching the man that the Silver Racer used to be -- a man named Willie Lincoln. The Silver Racer finally decided that he would stand idle no longer and attempted to bring death to the one who had evaded his touch longer than most -- Galactiac. But before Silver Racer could have an impact on the battle, Johnny Stormtrooper destroyed Galactiac's circuitry from within, sacrificing his own life in the process (Johnny Stormtrooper was apparently the dead hero whose life the Silver Racer originally intended to claim). As the Challengers of the Fantastic mourned the death of Johnny Stormtrooper, the villainous Doctor Doomsday disabled the Silver Racer and stole the Asgodian avatar's skis as well as his cosmic touch of death. (Challengers of the Fantastic #2) - "The Killer Skies" - Doctor Doomsday, enhanced with the cosmic Asgodian power of the Silver Racer, vowed to destroy the Challengers of the Fantastic. Fortunately, Susan "Ace" Storm was able to defeat Dr. Doomsday single-handedly. Presumably, the Silver Racer's skis and cosmic powers were subsequently returned to their rightful owner. Although first printed in the pages of JOURNEY INTO FOREVER, "To Die Like A New Asgardian" (the story depicting the first meeting between Silver Racer and Thorion) is now among Amalgam's DEMAND MASTERPIECES and was reprinted in 1997's THORION ANNUAL #1. In case you're confused, Amalgam Comics didn't really exist beyond those seen in the few DC / Marvel cross-over. The titles you don't recognize are amalgams of similar Marvel and DC comics--Snood. JOURNEY INTO FOREVER is an amalgam of Marvel's JOURNEY INTO MYSTERY and DC's FOREVER PEOPLE. "To Die Like A New Asgardian" is an amalgam of Marvel's "To Die Like A God" (THE MIGHTY THOR #139, April 1967) and DC's "Death Is the Black Racer" (NEW GODS #3, June-July 1971). DEMAND MASTERPIECES is an amalgam of Marvel's MARVEL MASTERPEICES and DC's DEMAND CLASSICS. In the Amalgam Universe, the terms "New Asgardian" and "Asgodian" are used interchangeably. Special thanks to editor Tom Brevoort for clarifying some of the component sources for his amalgamated characters and providing some additional insight into the Amalgam Universe! As Tom points out, DEMAND MATERPIECES was "probably more literally DEMAND CLASSICS and MARVEL MASTERPEICES -- the latter wasn't really the title of a series, but it was a term used often enough. I think we'd used "MASTERWORKS" someplace else, and so used "MASTERPEICES" here so as to avoid duplication.